This month is just flying by isn’t it? I can’t believe it is already the 18th. If you are just joining us for this 31 Days series, you can find all the previous posts on the 31 Days tab at the top. 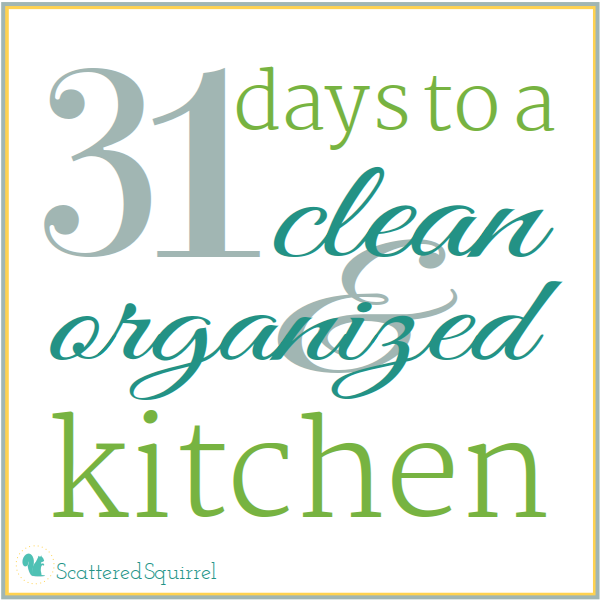 How is your kitchen coming along? Today I thought I would share another section of my kitchen binder with you. Let’s face it, there are times in life when we just don’t have the time or the energy to cook. In my house these times usually mean one of two things, either we order in take-out or go out to grab a burger or something. Not the most nutritious or cost-effective way of putting dinner on the table. I’ve been spending more and more time researching and testing recipes for make-head meals so that I can incorporate them into my meal planning and ensure my family is eating the best they can, even on nights when we have no time or I’m just too tired after a busy day. I have a few tried and true recipes I try to make up every once in a while. The first is spaghetti sauce. And while I may not have made quite as big a batch as I mentioned the other day, I do tend to make more than we need for one meal. The rest gets frozen for a quick and easy meal at a later date. If I know I’m planning on roasted chicken for dinner one night, I throw two in the oven. The second one gets shredded or cut up or left whole and tossed into the freezer, again, there’s a quick meal one night. Mostly, my make-ahead ideas are the main dish. Side dishes are easy enough to whip up. Travis add his own ideas to the mix, making home-made perogies and hamburgers. I LOVE his hamburgers, they cook up quick from frozen, just like those ones you buy pre-made in the grocery store, but they taste soo much better. There are other ways to save time and money in the kitchen. I was given a recipe book one time, called “Cooking With Cents” (to this day, it is the one item I regret donating when packing for one of our moves) At the time I had this book, I wasn’t really good in the kitchen. Oh, I could cook meals and bake goodies, but I didn’t spend as much time thinking about our meals. I made the same things over and over and baked the same goodies. So, cookbooks were kind of wasted on me. But this book is one I should have held on to. It was full of recipes for making master mixes, and cooking in bulk so you could freeze ingredients for later. Then there were recipes that used the mixes to create various yummy dishes and treats. I may not have the cookbook anymore, but I am spending more time looking up ways to make mixes at home. Like pancake mix, chocolate milk mix, biscuit mix, to name a few. Because I want to incorporate more make ahead meals and mixes into my meal planning I thought it would be a good idea to have somewhere to keep my ideas. 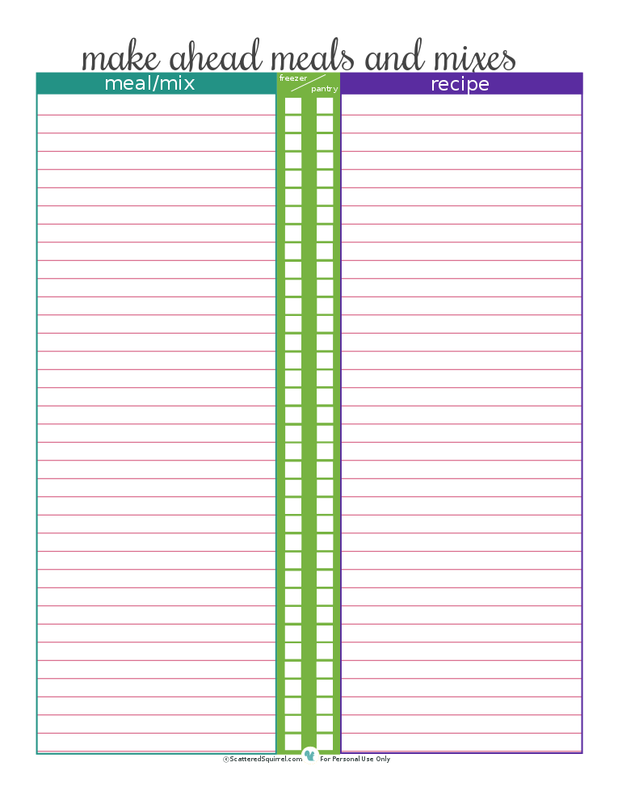 A simple printable to keep track of what I want to make, where it gets stored, (freezer or pantry) and where to find the recipe was in order. See, simple! I really want to incorporate more of these types of meals and dishes into our regular meal plan, and now, when I make up my meal plans I can check this list to see if I can fit one or more into my plans. Working a few make-ahead meals into my meal plan doesn’t really change how much cooking I have to do on one day, most often it is a matter of simply doubling the recipe, but it does allow me to save a little time on some other day. That’s a win-win in my book, and there is no more excuse to NOT do it. It might not be on the same scale as freezer cooking, but I think this is going to be a good step in the right direction for myself and my family. Having go-to meals in the freezer for days when I’m so busy with other projects, or with stuff the boys are doing, or I’m not feeling well is going to bring peace of mind to me, and help us save on our budget! What about you? 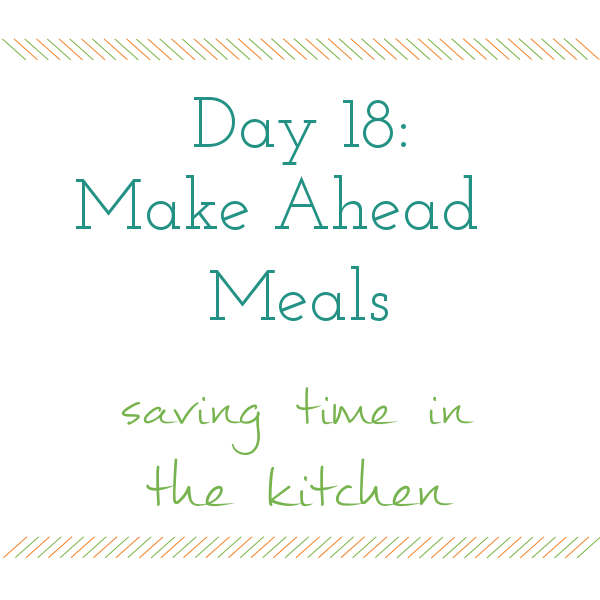 Do you make meals ahead of time, or double on recipes so you have something you can quickly pull out of the freezer? Any tried and true recipes or websites that you want to recommend? LOVE LOVE LOVE your site, your suggestions and especially your forms! I’m going to keep checking back and add to all social media I’m connected with. Thanks so much for such a wonderful comment. 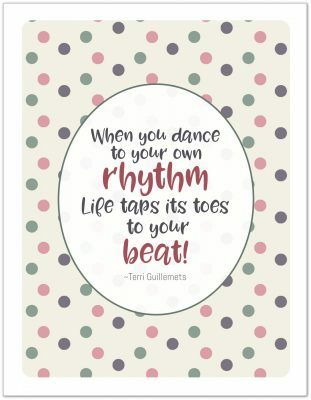 I hope you find a few printables that will fit your needs. 🙂 Thanks so much for following along.